Alex Woods is a quirky guy. A very quirky guy. 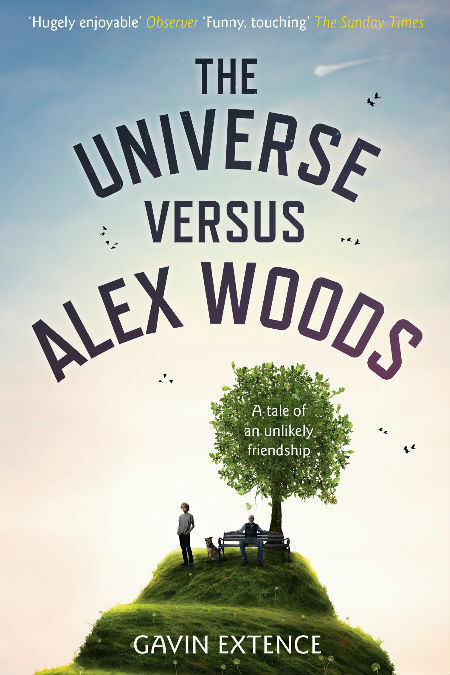 But then that’s what makes the protagonist of The Universe Versus Alex Woods by Gavin Extence such an endearing, affecting delight. Struck by a 2kg meteorite at the age of 10 when it comes hurtling, rather destructively, through the bathroom roof of the home he shares with his mother Rowena – who herself is the queen of idiosyncratic unusualness – Alex finds himself not simply missing an intact skull and some of his hair, but the subject of media fame, even in the non-viral days of 2004. While he mostly recovers, the accident leaves him with recurrent epilepsy, a condition that he learns to control in time with the help of his neurologist Dr Enderby and disciplined meditation every morning – Alex is the kind of kid that sees a problem, works out a solution and follows through; see, unusual but you love every strange, weird moment, trust me – but which defines his life in a number of key ways, not least the fact that it makes his tarot card-reading mum, who runs a New Age shop in Glastonbury, even more clingy than before. The joy of Alex is that he is both wise beyond his years, a result of a prodigious love of learning, an old soul and only child syndrome, but also typically, gloriously a kid, and then a teenager – the book takes us from age ten to seventeen – who doesn’t get everything in life right. So in other words, a typical kid fumbling his way towards adulthood and oft times, quite definitely not. One thing he does get right, up to the very end of the book which is profoundly moving and uplifting at once, grappling with some weighty ideas about life, death and how we choose to leave the former for the latter, is his friendship with the irascible Isaac Peterson. An aging American Vietnam vet with a deep and abiding love of Kurt Vonnegut, which he imparts to Alex to the extent that the young man creates a book club just to read and discuss the author’s satirically-odd work, he is mourning the loss of his English wife three years previously to a terminal disease, and while not a recluse and still reasonably engaged with life, is none too inclined to make new friends or get-out-and-about. Through a set of circumstances that owe a great deal to Alex, his persistent, mindless bullies from school and a broken glass greenhouse, the two meet, and what starts out as errands of restitution for the damage caused – in typical Alex fashion, he’s not even directly responsible for the damage but figures confessing the truth will only create more trouble – soon becomes much, much more. This most unusual of rewarding and decidedly non-mawkish of relationships – Issac is too gruff an old man to get too sentimental and Alex, while in touch with his emotions, is also winningly practical – becomes the centrepiece of this delightful book which balances some heavyweight ideas with some engaging quirkiness in the most exquisitely appealing of ways. It’s central idea is that weird stuff happens in life, and sometimes really sad and distressing stuff, but it’s how you respond to it that matters. 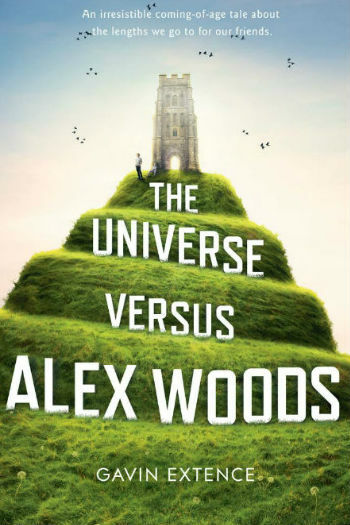 Unlike movies of the week or some trashy novel intent only on manipulatively reducing you to tears, The Universe Versus Alex Woods is rich with insight, truthfulness and the kinds of relationships which demonstrate again and again that you cannot judge a book by its cover. Many of the characters, and most particularly Alex, who you will come to love like few protagonists before him simply because he is honest, loyal, heartfelt and real, are socially awkward, a step too many outside of the mainstream for the great seething masses of conformist humanity to pay attention to. But beneath their odd exteriors are people with big hearts and open minds and a willingness to accept life on its terms, especially if it means being there, I mean really being there, for someone else. “I looked out across the open-plan living room through the patio doors. ‘I’m doing the right thing,’ I said. It’s the big heart of Alex that this will attract you, drawn you in and love him deeply. This unusual boy-then-man who loves Kurt Vonnegut, who diligently practises his meditative techniques and is more at ease talking to adults than kids his own age like emo-goth Ellie, who may like him and works at his mum’s shop, has a heart so big that he commits to a great many things in the name of his friendship with Mr Peterson that would make less robust and kindly souls quake with trepidation. It’s not that being there in some pretty major ways doesn’t affect Alex – he’s as nervous, and emotionally wrung out as the next person – but if life has taught him one thing, it’s that life is defined by the choices you make, and as someone forced to make some pretty big choices very early on in life, he knows what he’s talking about. As the friend between he and Isaac grows, and some fairly big sacrificial issues come into play, Extence does a beautiful, heart-rending job of showing us what true friendship, true selfless friendship, is like and how powerfully it can affect you. These truths, delivered through the earnest and quirky mind of our utterly endearing protagonist, imbue The Universe Versus Alex Woods with a beguiling mix of humourous lightness, observational truthfulness and soul-defining profundity, making it one of those rare books that will have you laughing and crying and thinking hard about what it all means. Just like life really, and if anyone knows what that’s really like, it’s your new best friend, Alex Woods, a character you will long remember and love, well after the final page is turned.